Did you successfully complete the 100 Articles in 100 Days Marathon Challenge (#HAHD)? If so, we’ve got one of these fine, limited-edition EzineArticles #HAHD mugs waiting for you! You must have your current shipping address on file with EzineArticles. Once we have verified your qualification, we’ll send you this handsome new mug via the US Postal Service! Mugs will be shipped by July 15th, 2009 & expect to see them before the end of this month. In the meantime, why not leave a comment and share your #HAHD success stories with the rest of the EzineArticles.com community. Originally, the article a day, I thought, was essentially a no brainer. However with a couple of new clients, finalizing my new book in May and promoting the book in June, time quickly slipped away and by the beginning of June I had only 52 article submitted and approved. Yet I believe once you make a commitment unless there is a life-threatening issue or something really beyond your control that turned into something threatening, you need to honor that commitment. So I hunkered down and started playing catch up. I finished the challenge on 6/29 with a couple of extra articles. This challenge revealed to me that a personal commitment is critical to goal achievement. Also as time was running out, I did have some writer’s block. Then I thought about writing book reviews (from a previous blog post) and quickly wrote 8 articles in less than 2 hours. From this experience, I wrote an article on article marketing and shared the template that I used to submit at least 4 articles in an hour. Anyone can make an excuse not to honor a commitment. Yes, things happen outside of our control. However, that should not become an excuse not to honor your personal commitments. This was a fun and a great learning experience. It really showed me how much writing articles is an important part of getting traffic to a website. I hope there will be more challenges in the future. I really enjoyed being involved and seeing how much support there was from others. I too, like Leanne, am about keeping commitments, especially to myself. It’s that part of me that builds character. And I too, felt I could handle an article a day, no problem and that’s why I signed up for the ‘challenge’. I even wrote myself a contract to finish the ‘challenge’ a week before the July 1st deadline. Then Yikes! On my 40th article I took on a ghostwriting project and it took more out of me than I expected. I got behind with my articles, then it was 3 articles a day to catch up, then it was 5 articles to catch up. But I was committed! What helped me to meet the challenge was when I got to my 50th article, I wrote on my kitchen dry erase board in big bold letters “June 22nd #HAHD Deadline” and I started a backwards countdown from 50, 49, 48, 47… for every article I submitted. Oh yes, I’ll be honest and say I did turn down one small writing project because I was committed to my own deadline. I actually finished two days early on June 20th. After I’d met the ‘challenge’ I wrote a few more articles just in case I mis-counted. But, wow… I did learn a lot and it was a very profitable experience. I believe that commitments like the #HAHD Challenge makes us a better person both personally and professionally. Oh WOW what a journey that was! From wondering whether I had 100 articles in me to Oh my goodness my fingers can’t type fast enough to keep up with the ideas and then from nowhere…. DEAD… not even the faintest idea of a topic – this became a cycle I repeated many times over. I learned that the dry times are always temporary so just work through them expecting that it will change and it will. The worst was when I got to about #93. Seeing the finishing line should have been a motivator but I was suddenly hit with, “I’m sure I’m writing nonsense. I don’t think I can do this.” What at 93????? JUST DO IT! And I did. Whoosh what a feeling when I crossed that line! Of course I did a raucous victory lap as all winners should. Wish you could have seen the look on my household’s faces. Learned so much about article marketing and even more about myself. Thanks Jeff, Chris, Ezine, and all the great people I met on the way. I just realized I posted my comment in the wrong thread. OOPS. I’m so excited to have finished this challenge. I had so much stuff happen during the course of me doing this challenge. I got sick thanks to Atlanta’s beautiful greenery and the pollen it produces. That stopped production for the whole month of April. On top of all of that, my toilet flooded twice in the past two weeks so I had to stop writing to deal with that. Whew. A lot can happen in 100 days. The one thing I learned from all of this is to be flexible. Just because you have made the best plan doesn’t mean things will happen the way you want them to. This was fun, and I enjoyed everyone’s comments along the way. I too, got “stuck” when in the mid-90’s but somehow kept on. And I too added a couple for good measure, just in case I had mis-counted. I always knew articles were important, but it is easy to push things aside when you get busy. This challenge put me back on the right track, and the commitment to myself to finish kept me there. Now, the next thing is to keep it up! Maybe I’ll issue a private challenge to myself for the month of July. Congratulations to all who had the discipline and commitment to finish this great challenge! I know it takes a lot to write 100 articles. It’s so easy to get distracted or to give up. The good thing is that you see instant results as soon an article gets approved. You quickly get the first traffic to your web site. However, you only realize the full power of article marketing once you have 100 articles online. I bet you agree that this really makes a huge difference and you are happy about the results! I started out thinking “can I really do this?” and finished with 118 articles. It was a great experience and the writing got easier as time went on. Thank you Ezine for the superfast approval time. And congrats to all who reached their goal! Why don’t you have contests that say.. Submit 1 article in a day and get A MUG or something free after you submit 10. Thats a more realistic goal rather than the 100 articles in 100 days. I just sent 354 members who qualified an email as the deadline is Tuesday night (tomorrow, July 7th) to get your free mug. 354 out of 160,000 when this challenge began equals 0.0022%. Pretty revealing! This only reaffirms the few vs many philosophy. Only a few will achieve success even though many want success. Personally, I considered myself lucky to be included with so many others who share this belief. the project caused me to get a lot of niche material that I cover in my seminars out of my head and onto paper. The bundle of essays has become an important part of my value add to my clients and has made me a more effective teacher, trader and writer. Thanks very much for the boost. Publish or Perish can’t be more true. Whenever I get some free time I like to sit down and review other companies. I write these reviews from scratch in my own words so it’s a win/win for EzineArticles and myself. To be honest the mug deal I wasn’t aware of until today. But I look at the free mug as just icing on the cake. The real reward are the targeted leads those articles will produce for years to come. We’ve always had a good relationship with EzineArticles, I think they receive 1000 or so hits a day from us and we get about 100 from the articles. THANK YOU for all the encouragement and fun with EzineArticles friends. THANK YOU FOR THE GIFT~! I will keep it by my computer as a reminder that creating new things is indeed a privilege. It is available to all of us, anytime we choose to meet the call. Inspiration is indeed all around us.. not so very far away at all. This challenge has reminded me of that. This was absolutely the most incredible experience I have been a part of in a long time. I kept telling people it was like running a marathon, with a crowd cheering for me as I wrote each article. So many people believing in me and encouraging me to finish. It was a true test of endurance, patience, time, creativity and so many other lessons learned along the way. I made a public statement to everyone in my network that I was in this challenge and I never back down or give excuses, I see things through to the end. Although there were times I felt like quitting! I hope I have inspired a few others to take on the next 100 articles in 100 days challenge. Like several others, I wasn’t sure if I could write that many articles about one topic. I finally let go of that theory and wrote about other topics and things I knew and the articles kept writing themselves. I am now listed number 2 in the business networking category, have had several articles featured in “most viewed” AND “most published”. Plus, over 5,000 people have viewed and/or read my articles! In fact, several national publications are picking up my articles and publishing them in magazines! Lots of opportunities are presenting themselves because of this challenge! Thank you so much! I can now say with confidence and integrity I’m a published author! Just like several others, I made a public commitment that I was doing this challenge and I never back down from fulfilling my obligations. There were times throughout the 100 days that I thought I could easily give up but I’ve never been known as a quitter! I told others it felt a lot like what a marathon must be like. A true test of endurance, patience, willpower, creativity and a bunch of other life lessons. The support I received and the encouraging words that people shared was amazing! Now, I’m proudly listed #2 in the best authors in the Business Networking Category! Plus, my articles have appeared in the “Most Viewed” and “Most Published” with over 5,000 people that have read them! The increase in website visitors have also spiked! It has opened the doors for lots of other opportunities as well. In fact, some of my articles will be published in national magazines! Thanks for putting this together! I hope I have inspired others to take on the next 100 articles in 100 days challenge! P.S. 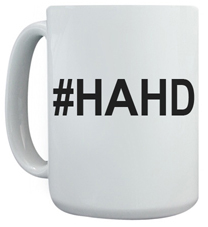 I can’t wait to get my #HAHD mug to proudly display in my office! Glad to hear that I was among the 354 out of 160,000, :D Interesting. I am on my way to becoming one of the highest submitters in the next couple of months – yep, I am working on getting to 1,000+ articles submitted and approved in the next couple of months. And thanks for the mug, Chris. Pleased to be one of the successful #HAHD writers too. Well done to all who made it and all who tried. Remember there’s always next time. Oops, not one of the 354 out of 160,000 but out of 182,739. That’s impressive, I’d say – for anyone that made it. And yes, Marcus, you are right – there’s always a next time… for everyone. I suspected quite a few of our members didn’t know about this contest. It was announced in our newsletter, blog and twitter account heavily since March. :-) Hint hint… Subscribe to our newsletter. So far, 137 have claimed their mug and the deadline to request it is tonight at Midnight. Thank you for the email reminder that I qualify for the mug. yeah…that was fun! I finished with exactly 100 articles….wootwoot! Only 137 members have claimed their mug? Well about using the leftovers to start a new contest? I’m in. Final tally is 147 claimed a limited-edition #HAHD mug. Congrats to all who completed it! How strange that so many would not claim their mugs. I claimed mine, and I’ll use it even more proudly, knowing that so many started the challenge and didn’t finish. Yeah that’s odd, why would you “win” a race and then not pick up your trophy? Perhaps for some, their participation was so intrinsically motivated that qualifying was reward enough? Personally I like the idea of a concrete reminder. Then whenever I am having one of those awful self doubt moments I can look to it to remind myself that I can achieve anything. I kind of understand not claiming the trophy… cause it wasn’t about that really, it was more the idea of a trophy. I almost did not claim mine either.. I can’t even explain why really. BUT I DID! LOL! Yup I decided YES~ I WANT IT! Maybe people have not claimed them because #HAHD is not that attractive. Gee. I was on vacation and could not claim my mug :( can I still get it ??????? If you qualified, sure… we’ll sneak you on the list. With so many new Platinum members last month (more than double over May) we were caught off guard and had to rush order more Mug boxes… That means the #HAHD mugs are expected to ship on or before July 27th. Just got my #HAHD Mug and the “added goodies”. THANK YOU Chris, Jeff, Ezine staff and especially ALL the participants!!! What a Trophy! I have still not received it… Has anyone from india got #HAHD Mug so far? But when I opened the box and found it full of extra goodies, I couldn’t wait to go find my husband and show him. What a fun thing to get such a surprise! Thank you so much for adding that element of fun to my Monday. Did I read that right? A new challenge starts on Saturday? Is there a new challenge coming up ? If so, I’ll be so excited to give it another shot. Just received some Platinum Status goodies – that was a surprise and with the # HAHD trophy still to come, there’s more? Hurrah it’s like Christmas in July! Thanks Chris and Ezine. You guys rock! Yes, it’s true… the next big #HAHD Challenge starts August 1st! I have still not received it. How can i check the status? Ohh I almost feel guilty for all the goodies just received! Almost.. lol. Coffee too? MmmWA!! Once again EzineArticles proves themselves to be a total class act. Yours was mailed on 07/24/09. Look for it shortly. Yay Yay. Yipppeee :)))) I’m sooooo looking forward to it :)))))) Thanks a TON, Marc ! I got my mug a few days ago! I’m so excited! Got my mug, coffee, note pads etc etc.. in di mail just now :) I’m so thrilled. My mom is so proud – She thinks I’m doing a lot of hard work ;) lol. She doesn’t know this is soooo much fun ! Yay. I just got home from vacation and my mug and other goodies were waiting for me. What a great homecoming! Thank you Chris and EzineArticles. I’m going to take a pic and blog about it next week. And best of all a new challenge starts today. Gotta go write a new article. Later.